Anatomical artwork visualizing a pregnant woman in her 30th week. The inset next to the woman also depicts a 30 week fetus and placenta in the mother’s womb. 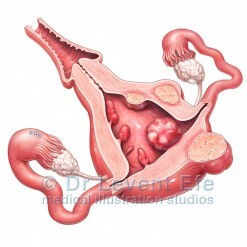 This illustration can be ideal for print or online publications for educating women on weekly changes during pregnancy. SKU: OG9. Category: Obstetrics and Gynaecology (O-G). Tags: 30_week_fetus, 30_weeks, 30_weeks_pregnancy, fetus, pregnancy, pregnant, third_trimester, uterus. Conceptual art showing a cut-away image of fetus in the uterus, during the 30th week of pregnancy. 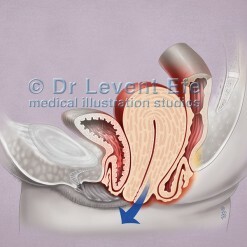 The image provides a realistic and proportional view of the size of uterus and how it pressures on the bladder. Mother’s bodily changes consistent with the third trimester are also more prominent, like enlarged breasts and edema in the legs. 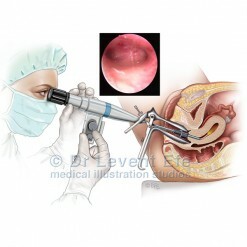 Details of the placenta, umbilical cord and developmental changes in the fetus can be observed.